In July, they discovered a giant black granite sarcophagus that contained the bodies of three men, one of whom might be Alexander the Great. In November of 2017 they found a hidden space inside the Great Pyramid of Giza, the first discovery of an internal chamber since the nineteenth century. In December of last year, a team uncovered a large tomb in the ancient necropolis of Saqqara. Never looted, like most tombs in Egypt, it contains vivid paintings and hieroglyphs in nearly perfect condition. These exciting finds got me thinking about Boston’s Egyptian Revival sites. We have more of them than you might think and some go way beyond a few decorative motifs. When Napoleon Bonaparte embarked on his Egyptian campaign of 1798-99, he brought more than 160 scholars, artists and scientists along with the troops. They worked in teams to document and catalog what they saw in Egypt. These teams produced “La Description de l’Égypte,” an enormous multi-volume work that included folio-sized plates and maps along with scholarly essays, and a detailed index. Editions appeared in 1809 and 1830. For the first time, ordinary people could see into a hitherto unknown past, learning about sights and a culture they found fascinating and exotic. This, along with the associated discovery of the Rosetta Stone that allowed translation of hieroglyphic writing, sparked great interest in Egyptian art and culture throughout Europe and America. The Egyptian Revival style appeared in architecture, clothing, jewelry, furniture, and interior design. The major motifs of Egyptian Revival include obelisks, pyramids, hieroglyphs, the sphinx, scarabs, lotus blossoms gods and goddesses. Interest in ancient Egypt flared up again in 1922 when Howard Carter discovered the tomb of Pharaoh Tutankhamun with its hoard of 5,000 grave goods and golden sarcophagus. I planned to describe a list of sites and objects in this post but, as usual, it grew too large for just one piece. I decided to break it up into two sections. So, here is the first post,which deals with Egyptian Revival monuments to the dead in two notable cemeteries. You can find some spectacular pyramid tombs in North America but we have other Egyptian Revival elements around Boston. Cambridge’s Mount Auburn Cemetery, the nation’s first garden cemetery, was founded in 1831. It has two impressive structures with ancient Egyptian motifs. 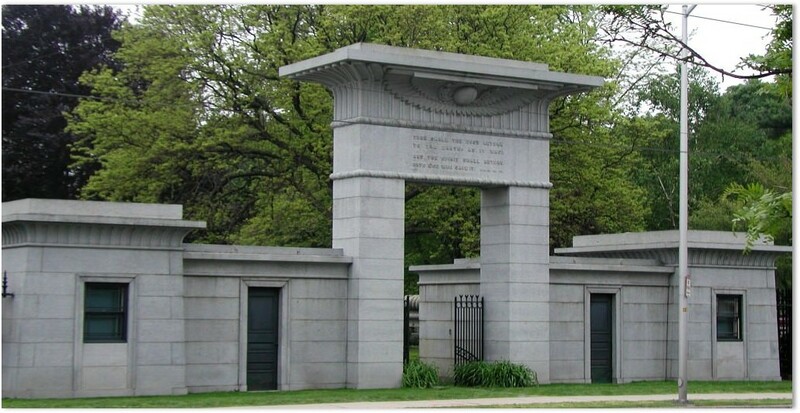 The Gateway: To enter Mount Auburn Cemetery, you pass through an imposing granite gateway. The first incarnation of this structure appeared in 1832 designed by Dr. Jacob Bigelow, one of the cemetery’s founders. Made of wood painted gray and dusted with sand when the paint was still wet, it had the appearance of granite but did not impress. Ten years later, a real stone structure of Quincy granite replaced it, erected by Octavius T. Rogers. Obelisks bracket the gateway connected by a wrought-iron fence to lodges in the style of Egyptian temples. To me, they look like miniature versions of the Temple of Dendur in New York City’s Metropolitan Museum of Art. Passing through the gateway takes you from the bustling world of the living to a beautiful and quiet land of the dead. 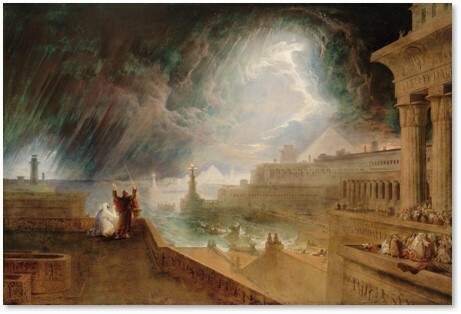 The gateway reminds us of the Egyptian belief in the ongoing life of the spirit. The Bigelow Sphinx: Once inside Mount Auburn Cemetery, it’s easy to find the giant granite Bigelow Sphinx. Just walk straight ahead and look uphill toward the Bigelow Chapel. I wrote in detail about the Sphinx in this post on the sculptor Martin Milmore. You can read all about it there and I won’t take up space replicating the information in this post. But you don’t get any more Egyptian than a complete sphinx with its face unmarred by the bullets of Napoleon’s army. In the heart of Boston and along the famed Freedom Trail, you find Old Granary Burying Ground. 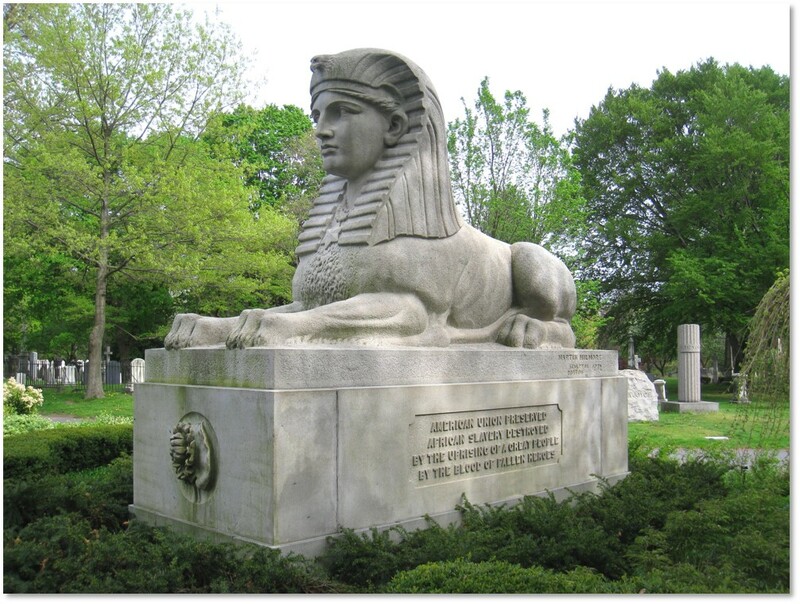 The city’s most famous cemetery also offers two Egyptian Revival monuments. The Gateway: Although Old Granary was established in 1660, the city of Boston took 140 years to create a well-defined entrance. Erected in 1840 and designed by Isaiah Rogers, Old Granary’s granite gateway also features a winged globe in deep relief on the cornice. Upside-down torches on the gateposts symbolize life extinguished. Isaiah Rogers duplicated the design three years later in the gateway to the Jewish Touro Cemetery in Newport, Rhode Island. Blocky Egyptian Revival pylons mark the corners of Old Granary. The front of each one bears the Victorian image of a winged hourglass,. which represents time and its swift flight. Mr. Rogers also used pylons in the Jewish Touro Cemetery but these are plain, lacking the hourglass motif. The Ben Franklin Monument: Passing through the gateway, you see a structure that has been described as a small, steep pyramid but looks more like the tip of an obelisk. This marks the grave of Benjamin’s Franklin’s parents. 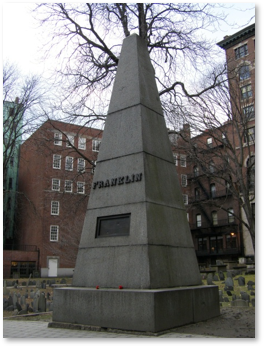 Although buried in Philadelphia, Mr. Franklin was born in Boston on January 17, 1706, the tenth son of soap maker, Josiah Franklin and his second wife, Abiah Folger. After raising 13 children and seven grandchildren during their 55-year marriage, his parents passed on and were buried in Old Granary. 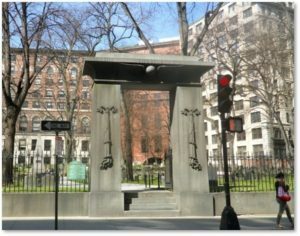 This granite monument replaced a brick one that Benjamin, their youngest son, erected in 1757 before he left for England. Constructed of stone taken from the same quarry as the Bunker Hill Monument, The Franklin monument anchors Old Granary with its solid presence. Guide books sometimes describe the John Hancock monument on the left side of Old Granary as an Egyptian obelisk but it was really modeled on a classical grave stele, more Greek than Egyptian. Yes, Boston has more Egyptian Revival structures and decorations outside of cemeteries. To keep this post from getting any longer, however, I will tackle those next week.